Centuries from Adam Voges and James Franklin gave Middlesex their second 400+ chase in two seasons, with Somerset the unfortunate losers at Taunton. 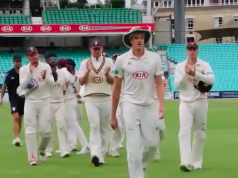 Having chased down 472 to beat Yorkshire exactly one year ago, Middlesex repeated their feat with an effort of 405-5 against Somerset, consigning the hosts to their second County Championship defeat of the season in the process. Devoid of last year’s hero, and double-centurion, Chris Rogers, Middlesex had to look to this year’s overseas talent to pull off this monumental effort, with captain Voges and Franklin making 200 runs for the fourth-wicket after early wickets had hampered their chances. Sam Robson, one of only two men in the batting line-up to have played in last year’s success, fell as the first wicket early in the day, caught in the slips off Lewis Gregory, before Nick Compton followed him back to the pavilion soon after courtesy of the same bowler. At 45/2, hopes of a victory seemed minuscule at best, but with Jamie Overton missing through injury and Taunton rewarding batsmen for their hard work and graft, perhaps all was not lost for the visitors. And so it proved. Alongside Nick Gubbins, who played excellently for his second half-century in the match, Australian Voges was allowed to break into his stride, with the pair putting on 92 together before Gubbins was bowled by Abdur Rehman for 78. Voges was not done there, however, as he and New Zealander Franklin took advantage of Somerset being a bowler short, safely negating the new ball before their partnership was broken with just 65 left to make – Voges caught behind off Tim Groenewald. Despite his captain’s absence, Franklin continued on his merry way, with a perfectly-paced chase that lasted well into the final session, as he finished unbeaten for 115 with seven balls to spare. 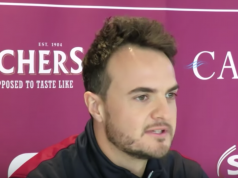 “It was an outstanding win for us given our position on the first day and particularly without Tim Murtagh bowling in the second innings. He had a back spasm, but seems fine now,” Middlesex skipper Adam Voges said. 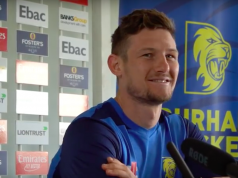 “I was very disappointed to miss out so narrowly on a hundred in the first innings, so it was good to get there today, although I would have liked to stay with James Franklin until the end.